Need to brush up on your diamond knowledge? Wanting to make this as easy/fast as possible? A one hour consult with one of our friendly experts is all you need to get you going! Diamonds have a long and storied history as being objects of desire. They are among the most precious and valuable stones in the world. No other object can express love, beauty, or desire quite like a beautiful, perfectly cut diamond can. These precious stones have been given as gifts throughout history, and are an essential part of our culture. The mere thought of one conjures up images of luxury and class, and their association with happiness is marriage is no accident. Weddings, engagements, anniversaries, or birthdays are all fitting occasions for giving this precious gift. 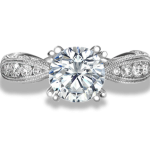 We’ll help you find the perfect diamond ring for your next special occasion. The jeweller that you choose is equally as important as the diamond that you choose. Randor Jewellers has a history of excellence in the Toronto area that goes back decades. We have the finest assortment of stones for all of your special occasions: weddings, engagements, and any other occasion you may need. Buying a diamond ring needs to be a well informed decision, so we provide you not only with great quality products, but with high-quality diamond education before you make the purchase. We take pride in having one of the most well respected names in the industry, and we stake our reputation on providing you with the very best in products and customer service so that your visit to us is as unforgettable as your special occasion. Give our design specialists a chance to make your dreams come true by coming in for a free consultation.